I know I haven’t been writing in here lately. I hope to change that, but I have been busy moving on with life Post Grad. It’s hard because the job market in my field isn’t doing well. So I have moved to Florida and am working part time for Disney in hopes of going full time and into something more important like management or entertainment. Anyways the real meaning of this post to let you guys know that I have changed my Social Vibe cause. While I still support To Write Love On Her Arms and think that you all should support it too, I have decided to change my cause to the American Diabetes Association cause. This cause is near and dear to my heart for many reasons, the main on being that my dad has been in the struggle with Diabetes since the age of 21. He’s now well into his 40s (sorry dad) and has a pump, but he still crashes. Lately, he took a really hard crash and it really hit home for us as a family. It’s scary when someone you know turns into a different person because their sugar is too low. My dad, usually a stern but fun guy, gets really giddy and way out of whack. You know when something is up. My dad has not only be in battle with Diabetes but also with Cushings Disease. We are very lucky to have him with us each and every day and I hope that he is alive for many more years to come. Right now, while they are finding a cure, we have to support them in their search. We have to support the advancement of medicine and research. We have to support the families of those who are battling diabetes as well and those who are struggling themselves. So please take the time to visit click the like on the side and support this awesome cause. Thank you so much guys for helping me help this amazing cause (as all the causes on Social Vibe are)! We all know that my favorite boys have a HUGE team behind them that they know and love with all their hearts. Afterall, without them, they would never have become as big as they are today. Well a few months ago I finally joined Team Jonas as a street team member. How do I support the boys? I will support my Favorite boys to no end. 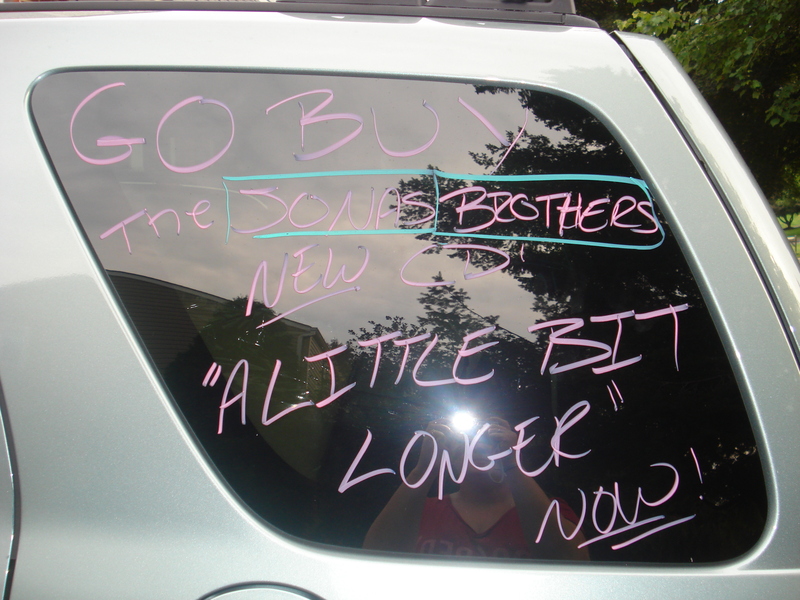 Currently I am planning to write something else Jonas on my car, but I’m not sure the exact slogan yet. All the support they can get is great! They deserve to be number one in all they do. 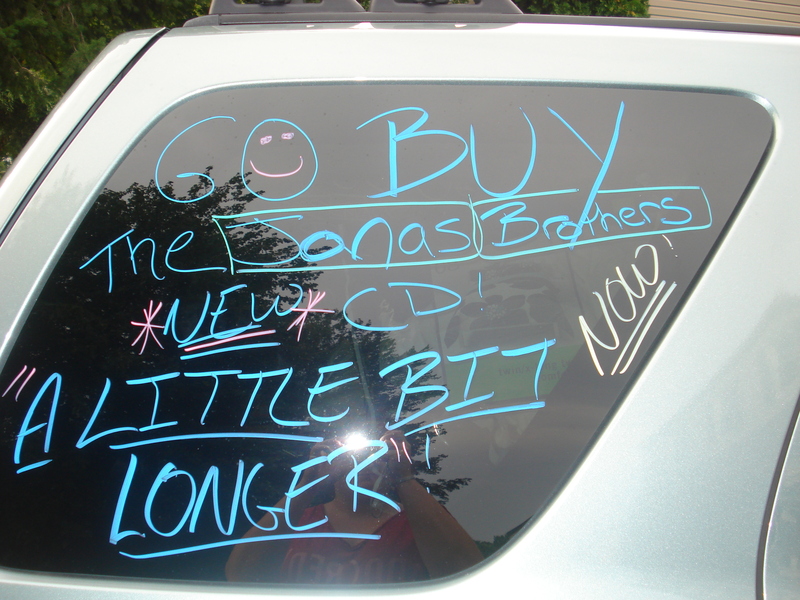 Keep a look out for the Crazy Jonas Car!